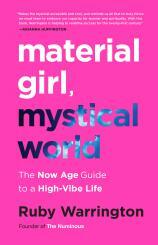 Utterly transporting and stylish, MATERIAL GIRL, MYSTICAL WORLD takes you on an unforgettable journey through modern spirituality --- from meditation and tarot to astrology --- guided by wise and witty tastemaker Ruby Warrington, founder of The Numinous. Inspired by the consciousness-shifting traditions that have moved seekers for generations, MATERIAL GIRL, MYSTICAL WORLD is a fabulous adventure in the “Now Age” --- a sophisticated upgrade on cosmic thinking, from healing crystals to doing your dharma, for women who know that a closetful of designer shoes can happily coexist with a deeply meaningful life. Combining the wit and charm of a modern-day Carrie Bradshaw with the stylish soul of Elizabeth Gilbert, Warrington shows us that it is within our power, right now, to create a life that is both intentional and fabulous --- while also contributing to a major shift in global consciousness. From how to survive and thrive at Burning Man to creating rituals that celebrate the Divine Feminine to exploring the shaman in you, MATERIAL GIRL, MYSTICAL WORLD is an inspiring call to arms for women looking to find their authenticity and voice in business, relationships and spirit, from Brooklyn to London to Venice, CA, and Black Rock City and beyond. A writer to watch, Warrington bestows on readers her wry, winning and ultimately wise take on modern life.